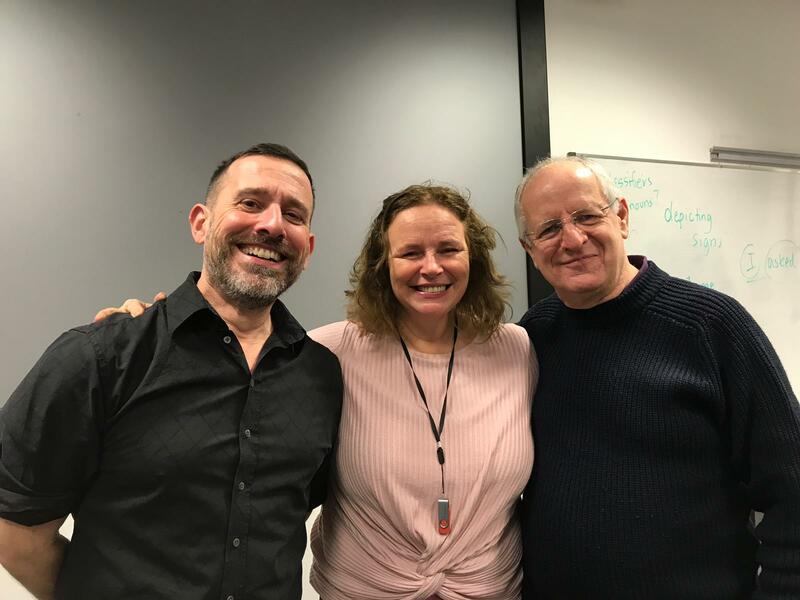 Dot Sign Language’s Level 4 and 6 students had an extremely exciting opportunity – Dr Adam Schembri taught a 3 hour class for them on BSL linguistics. Dot Director, Kathleen Grehan, is passionate about linguistics. She knows that being confident in linguistics is fundamental for students to understand BSL as a language, and to improve their signing skills. Dr Schembri is a leading researcher in the linguistics field He is based in the Department of English Language and Linguistics at the University of Birmingham where he teaches modules on sociolinguistics, language and gesture, and linguistic diversity. His research focuses on the linguistics of sign languages, especially Australian Sign Language (Auslan) and British Sign Language (BSL.) Previously he worked on the BSL Corpus Project at DCAL at University College London. He is also a published author of two books and numerous research papers. 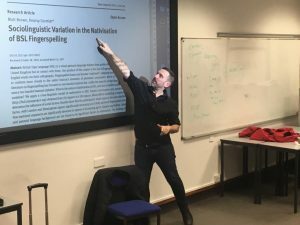 Last Saturday Dr Schembri shared insights into classifiers, agreement verbs, borrowing; and fascinating background information about the BSL Corpus Project. 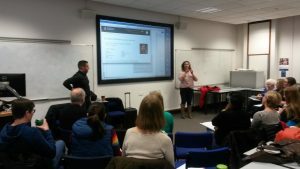 An extremely knowledgeable and engaging presenter, he delivered the class entirely in BSL. It was a fascinating class which gave the students a wonderful boost in both content and motivation for their courses. A huge thank you Dr Schembri for your time and for sharing your work, and to Kathleen for arranging the session.